It happened. On Monday I received official word from my editor that the manuscript for Writing Young Fiction for Dummies is moving on to production. “You’re done!” she said. Woo-hoo! Of course, that meant a chocolatey celebration with the four Halverson men. 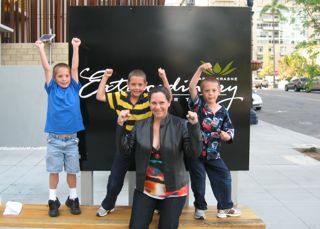 They chose Extraordinary Desserts in Downtown San Diego. If you haven’t been there, go. It truly is extraordinary. As are my men. They gave me the space/time to write the book even when that meant weekends or evenings. They gave me presents (toy cars from their stashes) last night and handmade signs, and it was their idea to pose victorious in front of the restaurant’s sign. Alas, the tallest Halverson man had to stand behind the camera, but he was there, too, as usual behind the scenes but smiling proudly. Yay, Deborah! I can’t wait to buy your book and read it while revising my YA novel. Your boys are so precious. That’s the sweetest thing, that they gave you their toy cars. You have a terrific support system! Thanks for sharing your good news with us. Ahhh…. you have a such a great team behind you! I LoVe the celebratory photo! I can’t think of a better way to celebrate than with chocolate!!! Except for maybe Disneyland and chocolate! CONGRATS! I can hardly wait to get a copy of your book and share it at critique! You should celebrate for months!!! Congratulations!! !